it's a great night out! Some fundamental beginner moves commonly taught at our Modern Jive classes. 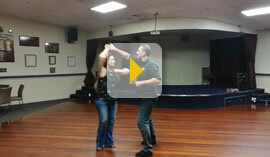 A sampling of Modern Jive beginner moves, with Jay & Mel at our West Auckland venue. Colin leading Barbara in a couple of Modern Jive beginner moves. 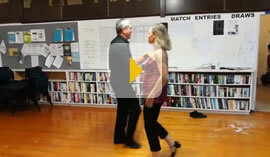 A sampling of beginner's moves at our Pakuranga venue, with Fred and Syliva. Rob leading Hannah in a couple of Modern Jive intermediate moves. Intermediate class, with some salsa elements and syncopated foot work for the guys. Colin leading Barbara in a couple of Modern Jive intermediate moves. A great chance to meet new people and try out your dance moves on them! ...which means that the musical options are extremely diverse. In any one freestyle session, the music played may include chart songs, classics, or something with a Latin twist. The songs can range from slow to quick and lively. The basic step remains the same, allowing for the moves to be stylised to suit the music choice. Like the latest dance news? We'll keep you informed of social events, competitions, class timetables, and more!